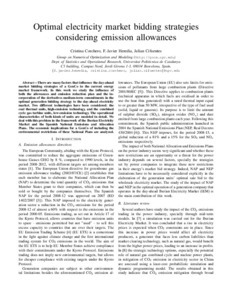 Corchero, C.; Heredia, F.-Javier; Cifuentes, J.
Corchero, C.; Heredia, F.; Cifuentes, J. Optimal electricity market bidding strategies considering emission allowances. A: International Conference on the European Energy Market. "9th International Conference on the European Energy Market, EEM 12". 2012, p. 1-8.